"All You Need Is Love": Fountain School takes on Dante's "Purgatorio"
What happens to us after we die? It’s a question that humanity has been attempting to answer for millennia. One of the more prominent theories is that we persist beyond our mortal flesh—and precisely what that existence might be is dependent upon our actions on Earth. Dante’s The Divine Comedy explores the Christian vision of the afterlife. It is a grand poetic work in three parts: Inferno, Purgatorio and Paradiso. 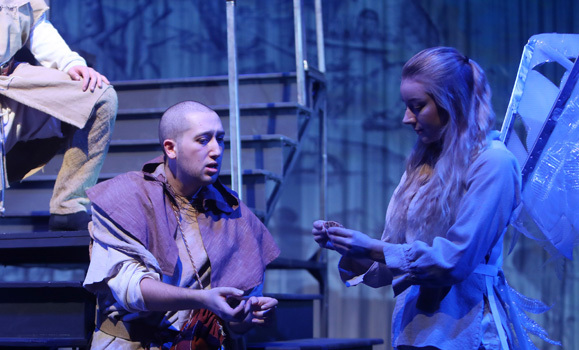 The Fountain School of Performing Arts’ production of Patrick Baliani’s dramatized interpretation of the second section of Dante’s legendary work is directed by the Fountain School’s own Margot Dionne, with original music by Fountain School alumnus Alex Arnold (BMus ’15). The production is both spellbinding and profound. 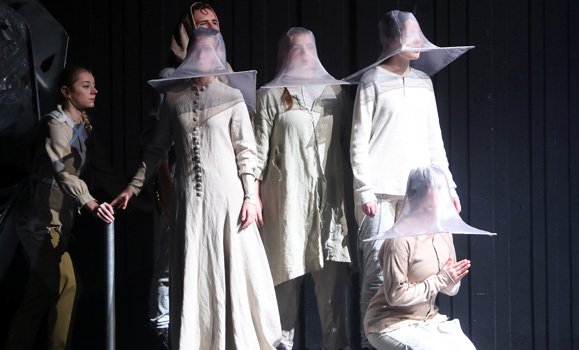 Dante’s Purgatorio uses the Dunn Theatre to its fullest extent, thanks to the vision of designers Karyn McCallum (set and projection) and John Pennoyer (costumes) and the excellent work done by students in Costume Studies and Technical Theatre programs. The very bones of the stage are exposed, and every inch of the theatre that can be used as performance space is. Elaborate staging, costumes, props, and projections all combine to create a show which is visually awe-inspiring. But the technical magic exists only to support a complex, thought-provoking tale which explores the idea of an afterlife. Although Dante’s Purgatorio approaches the afterlife from a Christian point of view, the themes that are examined and questioned as Virgil (Logan Robins) and Dante (Andrew Chen) guide each other through Purgatory apply universally. It is, without question, a serious exploration; there are few conundrums so serious as that of what happens after death. Yet somehow, there are ecstatic moments of hilarity in the play. “Baliani captures the celebratory and devotional spirit of medieval humour, characterized by its raw exuberance and earthy humour,” says Prof. Dionne. As Virgil and Dante journey past the different groups of sinners atoning for their misdoings, it becomes clear that what they are really searching for is the meaning of life itself. Dante’s Purgatorio proposes a number of possible solutions, and any combination of them might appeal to each individual. “I think Purgatorio speaks to the part of you that wants to be better… everyone wants to be better and do better,” says Rebekah Leon (Sapienza). “They want to ascend”, adds Katie Graham (Croupier). While there are an infinite number of ways to interpret the meaning of Dante’s Purgatorio, there is one theme that recurs throughout the show: love. Love is evident in every aspect of the show. It is clear that the actors have a great love for this show, a love in part inspired by director Dionne. “Margot has huge vision and is always sure to include all of her actors in that vision as we progress,” says actress Stephanie Mah, who plays Sordello and Sulpizia. “[We as a class] have gone through [our] entire program with Margot… I am so glad to have been able to share my four years with her!” Dionne’s passion and love for theatre for this are apparent in the depth of emotion that her actors bring to all of their characters. Love is only half of the double helix of human goodness in Dante’s Purgatorio. The other half is faith. Faith—in whatever form it takes for the individual — is “what you didn’t know you knew.” Dante’s Purgatorio suggests that faith and love are innate truths which cannot be fully expressed by words, and finding faith and love is a journey for each individual. "People should come to get a laugh, to get a different perspective of this medieval text,” says Leon. Dante’s Purgatorio is incontestably intricate play; however, its complexity does not make it inaccessible to audience members. The writing, technical effects, costuming, direction, and acting resurrect the essence of Purgatorio. Dante and Virgil’s journey through Purgatory is an invitation for the audience to consider their own personal journeys in a modern age ravaged by partisanship and hatred—to ask themselves whether it might be better to choose compassion and love instead. Dante’s Purgatorio runs from November 27 to December 1 at the Dalhousie Arts Centre’s Sir James Dunn Theatre. Tickets are available from the Dalhousie Arts Centre Box Office.